Our philosophy is to provide dancers with an encouraging, positive learning environment where students can achieve their individual goals and learn the value of working as part of a team in safe, family atmosphere. McConnell School of Dance is well into its 3rd generation, under the direction of Shayleen McConnell Finucan. The school offers classes in Winnipeg and Brandon, Manitoba. Our teaching methods are based on Irish tradition and also incorporate modern teaching techniques to accelerate the learning process. Class sizes are limited to achieve individual focus on our students and classes generally do not exceed an 8 -1 student to teacher ratio. All dancers receive one on one time with instructors and are encouraged to seek their personal best through training, hard work, and support from their instructors. How many classes per week should you register for? General dancers have the option to take one class per week or attend multiple classes. Dancers who take more than one class per week generally progress at a much faster rate. 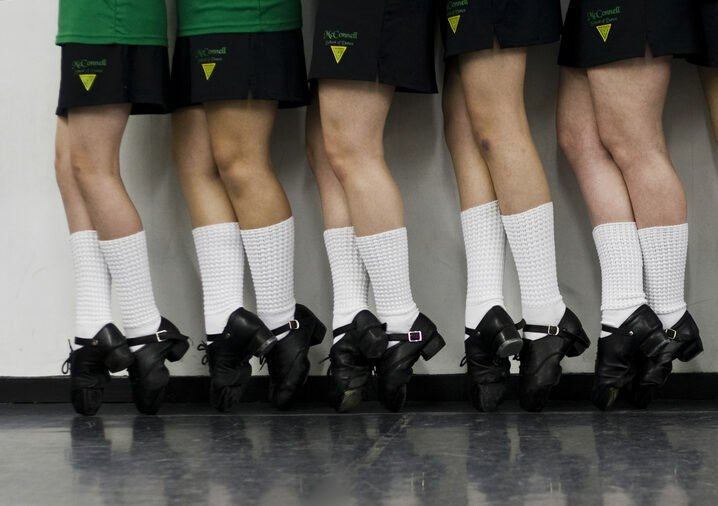 School costumes are required for dancers who wish to perform. Irish Dance Wigs are optional for all Recreational Division Dancers. 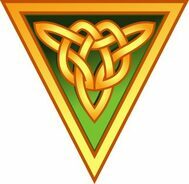 McConnell School of Irish Dance is a registered member of Cumann Rince Náisiúnta(CRN), based in Dublin, Ireland. Dancers compete in CRN's Open Platform Feis at the Regional, National, & World levels. 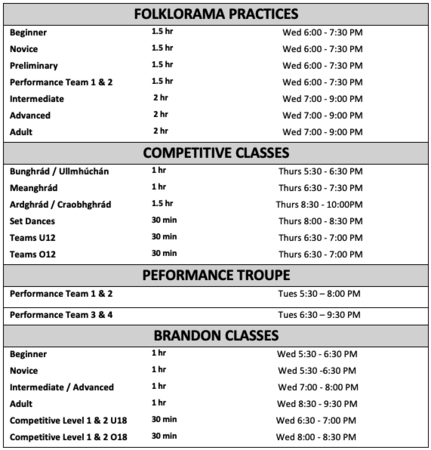 Dancers begin at Level 1 (Bunghrad) and progress through the Level 5 Championship (Craobhghrad). In most cases, achieving Championship level takes many years and a great deal of hard work. CRN North American Feis are held in Minneapolis MN, Dayton OH, Harrisburg PV, Philadelphia PV, and many other cities across the U.S.A, Ireland, Great Britain, and Australia. CRN Dancers also have the option to compete in any other Open Platform Feis. Team competitions are offered for traditional figure dances and modern choreography. Dancers must register for our Ceili Class in order to participate. McConnell School of Dance hosts the Canada Feile at the end of May. CRN Adjudicators are brought in from Ireland and all competitive dancers have the opportunity to compete locally, without having to travel. 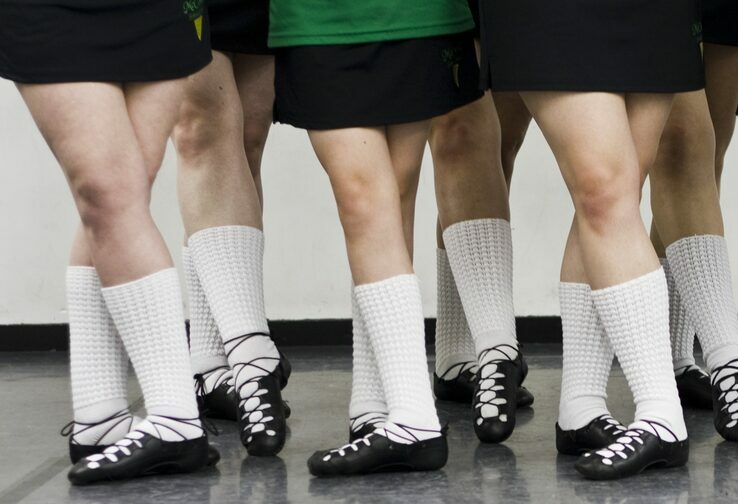 Shoes must be well-fitting and in good condition for competitive Irish dance as ill-fitting shoes will affect placement and interfere with dancers progress. 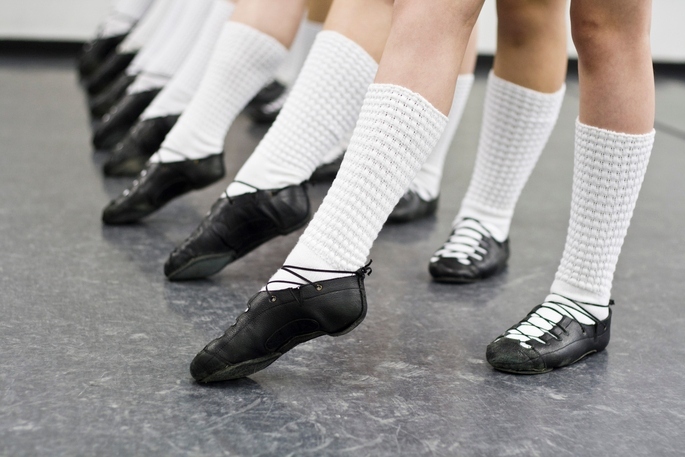 Dancers do not require a costume in order to compete in CRN feis & feiles. A simple skirt & blouse will suffice. Our competitive program is ideal for dancers who wish to brush up on technique or who need additional learning time. Irish Dance Wigs are optional for all Competitive Division Dancers (with the exception of those in team & ceilis). Competitive Division dancers do not perform at any of our events as their focus is strictly on competitive Irish dance. Students wishing to perform are encouraged to enrol in our Recreational or Performance Division. Enrolment in Performance Division is limited and dancers must complete 1 full season with the school prior to application. All Performance Dancers are required to attend competitive solo & ceili/team classes for their appropriate level / levels. Are required to be in attendances at all classes two week prior to any major performance. Costume, Additional Show Costumes may be required. Team 2 to 4 - Team 3/4 Costume $900 - $950 , Solo Costume, Additional Show Costumes may be required. There will be a minimum of five students in a class. Levels that do not meet the minimum student requirement will be combined with other classes or you will be offered the option for semi-private or private rates. A yearly, non-refundable, registration fee will apply for all students. Family Discounts are applied (same household). 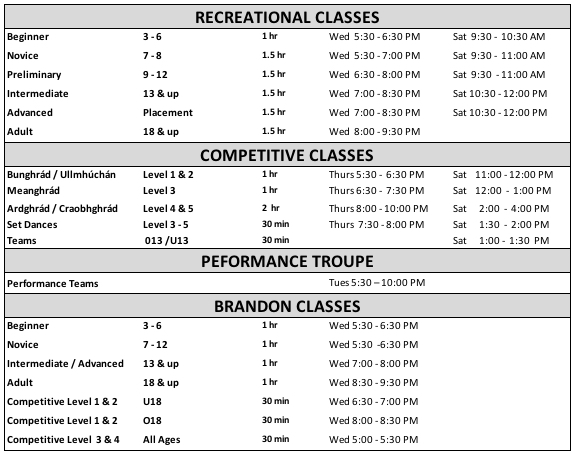 FALL - WINTER DANCE SESSION includes approximately 36 weeks of classes, September through end of May. SUMMER DANCE SESSION includes approximately 8 weeks of classes, June through end of July. Fees are based on an average of 4 classes per month including statutory holidays and breaks. In an effort to assist in keeping fees as low as possible, we offer a reduce rate multiple class hours and family discounts​. Fees are divided into monthly payments, for the duration of the session. Monthly fees may be scheduled for the 1st or 15th of each month. Monthly fees are processed automatically through a secure on-line payment processing (SafeSafe). Credit cards must be registered on our secure card processing system (SafeSafe) at the time of registration. Account details must be registered on our secure processing system at the time of registration. $25 Fee automatically applied to declined transactions & Late Fees will apply. To ensure tuition payments are made in a timely manner, late fees will be applied to any payment outstanding two weeks of the due date. The due date is your selected payment date (1st or 15th of each month). Late fees will be automatically charged to the credit card or bank account on file (provided at time of registration). If there is a family emergency or extenuating circumstances, please reach out to us to discuss potential payment plans. We are always willing to work with families who require financial considerations to insure dancers can continue to take lessons with our school. Discounts are only available to accounts paid on time. Discounted pricing is available to individual dancers taking multiple weekly classes and is automatically calculated in the Student Portal monthly fees. Family discount pricing is available to all dancers enrolled in classes from the same household. Family Fees are calculated after Multi-Class Discounts to ensure the lowest possible rate for pupils. Please note, due to restrictions with our Student Portal, discounts are not automatically applied when registering for classes in the Student Portal. Please allow 24 - 28 hours for our system to apply your discounts before attempting to process fees. Monthly Tuition and Registration fees, once processed, are non-refundable and non-transferable. Dancers are expected to attend classes for the full term they have registered, however we understand there may be extenuating circumstances where dancers withdrawal from classes prior to the end of the season. First year students may withdrawal without any additional withdrawal fee charged within the first 4 months of classes. After 4 months a $30 withdrawal fee will be applied. All other dancers who wish to withdrawal from classes prior to the end of the term will be subject to a $30 Early Withdrawal Fee. Written notification via email to info@mcconnelldancers.com must be received by the 1st of each month in order for monthly fees to be cancelled. Once processed, monthly fees cannot be reimbursed. Missed classes due to dancer's scheduling difficulties will not be refunded or applied as credit. 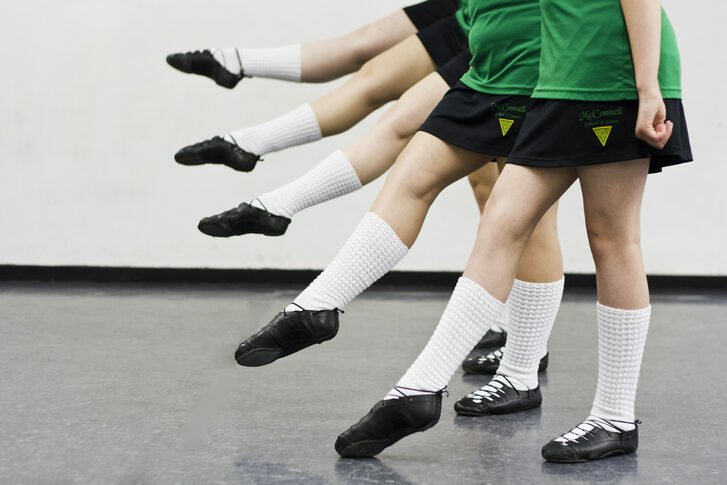 Dancers are expected to attend the classes they have registered for.​ An excessive number of missed classes, as determined by McConnell School of Dance, may prevent your dancer from participating in certain performances and competitions. Make-Up classes are not available for Recreational or Performance classes as our choreography is planned for each lesson. Make-Up lessons for Competitive Division classes are only available in the same week of the missed lesson. Please contact us prior to attending a make-up class. If a class is canceled due to inclement weather or other unforeseen reasons, an email will be sent to all registered dancers at the email addresses provided at the time of registration. Cancellation notices will also be posted on FACEBOOK, INSTAGRAM , and on our MSD website. Dancers who's lessons have been cancelled due to inclement weather are invited to attend a Competitive Division Class the same week, to make up for the missed lesson. Please contact us prior to attending a make-up class. If a major performance, competition, or other MSD or MSDSA sponsored event is scheduled during class time, there will be no tuition refunds, adjustments, or scheduled replacement class for any students. The studio is open 15 min prior to classes commencing. Dancers are encouraged to arrive early enough to allow time for them to get changed into their dance attire so they are ready to begin classes on time. Classes 1.5 hrs. and longer will receive a 2 - 5 minute break during their lesson. Dancers are welcome to bring snacks from home. Please try to avoid snacks with peanuts as we do have student's with allergies. Please to arrive on time for pick-up. Additional charges may apply for dancers who frequently delay instructors departure time. ​Parking is available in the 4 spots in front of the studio and on Barberry Road. Please do not park in spots designated for other businesses as your vehicle may be towed. Our waiting room is open during classes for dancers or parents. As space is limited, please refrain from bringing additional family members or friends. Outdoor footwear may be worn in the waiting room, however if dancers or parents wish to use the restroom or enter the studio, please remove all footwear first. Please keep the waiting room a positive environment and avoid discussions which may be considered negative, controversial or upsetting to a healthy learning environment for our dancers. Only dancers allowed in the change room, for privacy reasons. Please remove outside footwear in the waiting room, before proceeding to change room or restroom. No food or drink in the change room or dance studios. No outside shoes in dance studios. ​Dancers are to remain in the waiting room until the previous class has left the studio and their instructor has come to waiting room to welcome them in. Please do not enter the studio once classes have began. Please do not enter the studio once classes have began. Dancers, please knock if you are late for class. Parents, please do not enter the studio at anytime unless invited. Dancers are to remain in the rehearsal studio unless excused by the class instructor. No cellular phones, laptops, cameras, video cameras, iPods, or books allowed in rehearsal studio. Please speak with your instructor if you would like to video tape step. Regular attendance is expected for all dancers. Students who miss classes and fall behind may not perform in all routines or may be asked to take additional private or technique lessons to catch up with their class. Attendance will be taken at the beginning of each class. Parents are asked to email info@mcconnelldancers.com or call / text (204) 793-8557 to inform us of absences. Any dancer causing a disruption will be asked to sit down or leave for the duration of the class. Parents will be notified of any issues immediately after the lesson. Dancers with excessive behavioural issues will not be allowed to continue their dance training at McConnell School of Dance. Please speak with your instructor if you would like to video tape steps or record music. If you wish to change your contact information or add additional family members, please use the Student Portal to update your information. It is the pupil's responsibility to insure you maintain up to date contact information. Instructors are not available to meet with dancers or parents during class hours as their duty is to teach the class. Please do not disturb instructors during class time & be aware your instructor may have another class to teach after yours. Serious issues should be dealt with immediately after the class. Please ask to speak with your instructor after class, should any issues arise. Please respect our instructor's privacy and after-dance-hours time. They spend a great deal of their own time to make your dancer’s experience as good as possible. Please do not send Facebook and Instagram messages to a teacher’s personal Facebook or Instagram page. All MSD-related matters should be sent to info@mcconnelldancers.com or call (204)793-8557 during business hours.